----Bruno has decided to do something a little bit different with a look at wrestlers that he has worked with through the years. I will try to post a photo with some fun facts from http://www.onlineworldofwrestling.com/ and then Bruno will try to give us his views in a short story or profile on the worker. -January 14, 2001 - WCW Sin: Scott Steiner defeated Sid and Jeff Jarrett and Animal in a 4-WAY to retain the World title. Sid jumped off the second rope and snapped his leg, a double compound fracture, in a truly frightening moment. -Sid's son Gunnar debuted last year under the Lord Humongous gimmick. -Downtown Bruno talks about Sid. 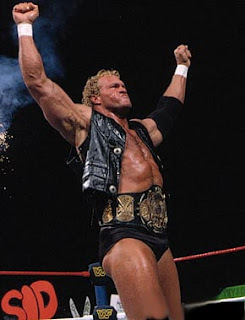 I cannot say enough good things about Sid Vicious. Let’s face it; he was born to be in this industry. He paid his dues in full to get to the top of the mountain. Before he became world champion in both WCW and WWE, he slaved away in a lot of small promotions in Arkansas and Missouri for little or no money. This was before he finally got his initial break in Memphis around 1985. In this first Mid South Coliseum appearance, he was a ringside enforcer for the “Fabulous Ones” [Stan Lane/Steve Keirn] as they took on the “Sheepherders”. [who later became the “Bushwackers”] Jonathan Boyd was in the corner of the “Herders”. Legend has it that Sid was not trained 100% in the doings and going of the business yet. Bill Dundee told him that his job was to be sure Boyd did not interfere in the match and that’s exactly what he did!! I am sure a 300 lb, near 7 foot tall 20 something year old giant of a man built like a brick shithouse coming at you was not a pleasant site for Boyd. Sid and I went on to Alabama and Knoxville and worked for the Fullers. Sid being Lord Humongous under the mask. Eddie Gilbert gave Sid a break by giving him his first national exposure in WCW back in 1988-89. From there he made his impact nationally and went all the way to the top, which he surely deserved. ----“Downtown” Bruno Lauer is a legend in Memphis Wrestling. He is two time RRO Referee of the year. He can be seen every Friday night working for NEW in West Memphis, AR. He appears bi-weekly with his non controversial column. Lauer had his biography published last year “Wrestling with The Truth” and can be purchased at www.crowbarpress.com. Lauer is also currently employed by the WWE.